The British government announced Friday that more than 4,000 former Gurkha soldiers are entitled to settle in Britain, but Gurkha supporters quickly denounced the measure as meaningless. Supporters have fought for years for more rights for the Gurkhas, Nepalese soldiers who have been part of the British Army for nearly 200 years. Gurkhas have fought alongside the British Armed Forces in every conflict in that period, including both world wars, and are known for their ferocity and pride. 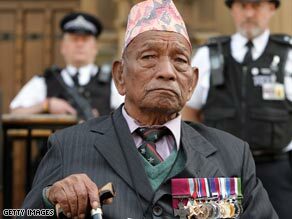 Despite their centuries of service, Gurkhas were not given the right to settle in the United Kingdom until 2004. And even then the order applied only to those discharged after the British handover of Hong Kong to China in 1997, when the Gurkhas Brigade moved from Hong Kong to Britain. The government’s announcement Friday applies to all Gurkhas, including those who left the army before 1997, if they meet one of five criteria. It also says around 6,000 of the Gurkhas’ dependents may be able to apply for settlement in Britain as well. “The guidance honors the service, commitment, and gallantry of those who served with the Gurkhas Brigade,” Border and Immigration Minister Phil Woolas said in a written statement. The Gurkha Justice Campaign, however, said the government’s criteria for the Gurkhas’ resettlement are unrealistic and too difficult for many of the soldiers to meet. “Only a tiny fraction of the Gurkhas who retired before 1997 will win settlement rights under the new policy,” the campaign said. “The campaign for full Gurkha justice will now be taken back into Parliament and the courts. The government needs to know they will have a huge campaign against them who will commit to righting this wrong.” The High Court ruled last September that the 1997 cut-off date was fair, but added that caseworkers needed revised guidance on deciding the cases of Gurkhas discharged before that date. Under the guidance, Gurkhas discharged before 1997 must meet one of five criteria to be considered for resettlement in Britain: • Have three years’ continuous residence in Britain, before or after service; • Have close family settled in the United Kingdom; • Have an award for gallantry, leadership, or bravery while in the brigade; • Have a chronic medical condition attributable to or made worse by army service; • Have served for 20 or more years. Actress Joanna Lumley, whose father served in the Gurkhas while she was a girl, has been an outspoken campaigner for their rights. She said the new criteria are harsher than she expected. “They’ve given five bullet points which virtually cannot be met by the ordinary Gurkha soldier,” Lumley told reporters Friday. “This one page of criteria has taken the government four months to come up with. It has made me ashamed of our administration.” She said most Gurkhas are allowed to stay in the United Kingdom for only two years, so three years of continuous residence is not possible. Most Gurkhas, she said, also have not been allowed to settle in Britain with their families. The requirement for having won an award discriminates against the ordinary soldier who has no award, she said. “This sends out not only to the Gurkha soldiers, but to our own men fighting in Afghanistan and Iraq, the most appalling message: that unless you have been awarded a medal for gallantry, you’re not a real soldier,” Lumley said. Only officers are allowed to serve 20 or more years, she said, so most riflemen will not qualify for the service requirement. And proving that an injury is related to army service will be nearly impossible for most, she said. “How on earth are men who were injured in the 1940s, ’50s, ’60s going to be able to prove that their long-term chronic illness is attributable to injures received during their service” she said. A Home Office spokesman said the government believes hundreds of Gurkhas will still be eligible to settle in Britain. “We would not accept that,” the spokesman said of Lumley’s criticisms. “We would say that the criteria as we see it is fair and balanced.” The Gurkha brigade originated in the 19th century with Nepalese soldiers who impressed British imperial troops with their ferocity and military ability. The first Gurkha units were formed in 1815. They saw action in both world wars and were fundamental to the British military maintaining control of India in the 1800s. Today there are 3,400 troops in the Gurkha brigade, operating from bases in Great Britain. Most recently, Gurkha troops were used in the Persian Gulf War and the Balkan conflicts.